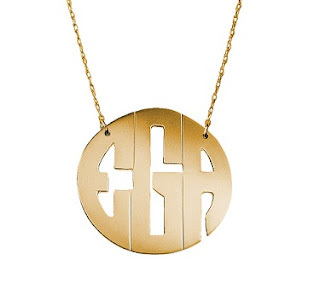 Carolina Clover is thrilled to announce a new partnership with Celebrity Monogram Jewelry Designer Jane Basch! Jane has designed jewelry for celebrities such as a mommy necklace for Kendra Wilkinson, a monogram for Taylor Swift, a nameplate necklace for Christina Applegate and a Layers of Lux for Brook Anderson, co-host of the INSIDER and many more! Now Jane's design workshop can design your custom monogram necklace, earrings, bracelet or charm. Mother's Day is Sunday May 13, 2012, so you'll want to order by April 15th with your ($tax return$) in order to be wearing your new custom piece of jewelry on Mother's Day! This is not an off the shelf item, your jewelry piece is created just for you so please allow 3 weeks for production.